Not to be confused with TV radios. This article is about the band. For the English radio broadcaster sometimes dubbed "TV on the Radio", see Tommy Vance. The band's third album, Dear Science, was released September 23, 2008 on Interscope. It was made available for streaming on their Myspace page and subsequently leaked onto the internet on September 6, 2008. The album was named the best album of 2008 by Rolling Stone, The Guardian,Spin magazine, The A.V. Club, MTV, Entertainment Weekly, the Pitchfork Media's readers poll as well as the Pazz and Jop critic's poll. It was also named the second best album of 2008 by NME and the fourth best album of 2008 by Planet Sound. On September 22, 2008, TV on the Radio performed "Dancing Choose" in the setting of a flight of outer apartment stairs on the Late Show with David Letterman. They also appeared on Later... with Jools Holland on September 30, 2008, performing "Golden Age" and "Dancing Choose", which were the same songs they performed on Saturday Night Live on February 7, 2009. The band performed "Dancing Choose" on the February 9, 2009 episode of The Colbert Report. On September 3, 2009, Tunde Adebimpe announced that TV on the Radio would be taking a year-long hiatus. Guitarist Kyp Malone's solo album, under the name Rain Machine, was released on September 22, 2009 on ANTI-. A solo album by Dave Sitek, Maximum Balloon, was released August 24, 2010 on Interscope, featuring a variety of guest vocals by many of his musician friends such as Karen O, David Byrne, and both of his TV on the Radio vocalist bandmates, and numerous others. In addition, Sitek produced Holly Miranda's album The Magician's Private Library, which also featured fellow TV on the Radio members Jaleel Bunton and Kyp Malone. In March 2010 the band's lead vocalist, Tunde Adebimpe, designed a charity T-shirt for the Yellow Bird Project to raise money for Haiti Relief via Partners in Health. On February 7, 2011, the band announced an end to their hiatus, along with their upcoming fourth album Nine Types of Light. On April 12, 2011, the album Nine Types of Light was released along with a one-hour film under the same name containing music videos for all the songs on the album as well as interviews with various New Yorkers. The film was directed by various directors under the supervision of Tunde Adebimpe. It was announced in March 2011, that the band's bassist, Gerard Smith, was diagnosed with lung cancer. On April 20, 2011, the band announced the death of Gerard Smith on their homepage: "We are very sad to announce the death of our beloved friend and bandmate, Gerard Smith, following a courageous fight against lung cancer. Gerard passed away the morning of April 20th, 2011. We will miss him terribly." 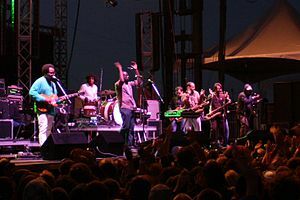 In May 2013, the band headlined and curated the All Tomorrow's Parties music festival held at Pontins holiday camp in Camber Sands, England, at which they debuted the new song "Mercy." The band began streaming the studio version of "Mercy" online on July 30, 2013 and released the song for sale on digital music outlets a short time later. The band also made the multitracks from Mercy available to fans so they could make their own remixes. The next single "Million Miles." was released digitally a few months later. Both songs were later released physically on either side of a 12 Inch single, released through Dave Sitek's Federal Prism label. On November 8, 2013, via their Facebook page, the band announced they were at work on a new album. The band made an official announcement July 29, 2014, that this new album, titled Seeds, was scheduled for a late 2014 release. In early 2015, it was announced that the band would perform at the Shaky Knees and Boston Calling Music Festivals in May 2015. On April 9, 2015 they announced a 2015 North American Summer Tour to promote the new album. The tour began in May and ran through a concert in Morrison, CO at the Red Rocks Amphitheatre on July 27. TV on the Radio has said that their eclectic music is due to their liking of very diverse bands, including Bad Brains, Earth, Wind & Fire, Nancy Sinatra, Serge Gainsbourg, Brian Eno, and the Pixies. Adebimpe covered the Pixies song "Mr. Grieves" under the TV on the Radio moniker at the beginning of his career, layering his voice over forty times. The band has also cited Prince's "Purple Rain" as a classic. TV on the Radio also named post-punk acts Wire and Siouxsie and the Banshees. Sitek stated: "I've always tried to make a song that begins like [Siouxsie's] "Kiss Them For Me" [...] with that element of surprise mode where all of a sudden this giant drum comes in". During the Season 3 opening episode ("Doubt") of Criminal Minds, which aired on September 26, 2007 TV on the Radio's song "Wolf Like Me" played just prior to the opening credits. "Wolf Like Me" was also included in the soundtracks for Project Gotham Racing 4, Need for Speed: ProStreet and The Crew, as well as being used in the 2008 film Never Back Down during a training sequence with Jake Tyler and Jean Roqua. It played during the credit roll for Detention, and during the closing credits of FX's Rescue Me in the Season 4 episode, "Tuesday". The song was included on Kill Your Darlings' soundtrack, and was featured in The 4400's Season 4, Episode 1, "The Wrath of Graham". TV on the Radio's song "Trouble" appeared in Season 3, Episode 4 of NBC's The Blacklist. TV on the Radio's song, "DLZ", was featured in Season 2, Episode 10 of AMC Network's Breaking Bad. Tunde Adebimpe had a cameo appearance in Season 4, Episode 1 of IFC's Portlandia. "Staring at the Sun" was included in an episode of HBO's John From Cincinnati. "Will Do" was appeared soundtrack in EA Sports video game, FIFA 12. "Family Tree" played during the credits of a Season 1 episode of the Netflix series Bloodline. "Halfway Home" was used in an advert for Season 3 of British drama Skins. Since 2016 "Lazerray" has been used as the theme song for ITV's coverage of the Six Nations Rugby Championship in the UK. ^ Phares, Heather. "TV On The Radio - Biography". AllMusic. Retrieved July 26, 2015. ^ Dahlen, Chris. "Return to Cookie Mountain". Pitchfork Media, July 5, 2007. Retrieved on June 24, 2007. ^ "The 40 Best Albums of 2006". Spin, December 14, 2006. Retrieved on November 2, 2007. ^ ""Wolf Like Me" on YouTube". YouTube. Retrieved 19 November 2014. ^ "The 50 Best Albums of 2008". Rolling Stone. 2008-12-25. Retrieved 2009-11-17. ^ Jonze, Tim (December 12, 2008). "No 1: TV On the Radio – Dear Science". London: Guardian. Retrieved 2009-11-17. ^ "The 20 Best Albums of 2008". Spin.com. Retrieved 2009-11-17. ^ "The best music of 2008". The A.V. Club. December 10, 2008. Retrieved 2009-11-17. ^ Montgomery, James (2008-12-17). "The Best Albums Of 2008, In Bigger Than The Sound". MTV.com. Retrieved 2009-11-17. ^ "10 Best CDs of 2008: Leah Greenblatt's Picks". EW.com. Retrieved 2009-11-17. ^ "2008 Pitchfork Readers Poll". Pitchforkmedia.com. 2008-12-12. Archived from the original on 2009-02-27. Retrieved 2009-11-17. ^ "New York Pazz and Jop". Villagevoice.com. 2009-11-10. Retrieved 2009-11-17. ^ "TV on the Radio - Dancing Choose on Letterman". YouTube. Retrieved 2012-03-30. ^ Montgomery, James (2009-09-03). "TV On The Radio To Go On Hiatus". MTV.com. Retrieved 2009-11-17. ^ "Rain Machine". ANTI. Archived from the original on 2010-01-03. Retrieved 2009-11-17. ^ Billy Jones (June 14, 2010). "an interview with Dave Sitek of Maximum Balloon (the TVOTR guitarist/producer's new project w/ many guest vocalists)". Brooklyn Vegan. Retrieved June 17, 2010. ^ Matheson, Whitney (2011-03-30). "Cool book alert: 'Indie Rock Poster Book'". USA Today. Retrieved 2013-11-28. ^ "TV on the Radio Return!". Pitchfork. Retrieved February 7, 2011. ^ "NEW ALBUM, Nine Types of Light, COMING SPRING 2011 – BAND TO PLAY RADIO CITY MUSIC HALL APRIL 1". Myspace.com. Retrieved 19 November 2014. ^ "TV On The Radio's Gerard Smith dies at 36". Marquee.blogs.cnn.com. Retrieved 19 November 2014. ^ "TV On The Radio 2015 North American Tour Schedule". April 16, 2015. Archived from the original on March 4, 2016. Retrieved April 17, 2015. ^ "ANNOUNCED: TV On The Radio East Coast Tour". April 9, 2015. Retrieved April 17, 2015. ^ "SoundToys Fanatic – David Sitek" Archived 2010-05-17 at the Wayback Machine Soundtoys.com. ^ Keyes, J. Edward. "TV on the Radio". Rollingstone.com. Wikimedia Commons has media related to TV on the Radio. Interview with Gerard & Tunde Brooklyn Rail 2008 – contains details of band's formation.